This week, using GPS locations from her collar, Paul and Chris F. located 11F’s final resting spot in the hills above Los Gatos, a town named after her ancestors. From what they could see, she seems to have died of natural causes in January, far from roads, people’s homes, and without any obvious injuries on her skeleton. Although she was relatively young, only 5 or 6 year old, she definitely lived an eventful life and led us to some interesting places. 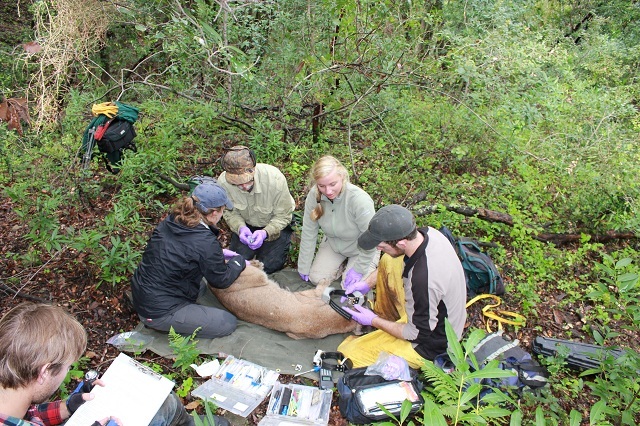 We first captured 11F in fall 2009, when she was a young and newly independent puma finding her way around this world. Her parentage is unclear, but she was probably raised in the Sierra Azul Mountains. Unlike most females, 11F liked to wander around … a lot, and we had a hard time keeping track of her, often losing her for months at a time. During the first year she was collared, she shocked us by traveling deep into suburbia and reaching Highway 85. We had a hard time believing the data, and Veronica went out to investigate her movements. Veronica found a small empty lot in the middle of a busy residential neighborhood, where 11F presumably laid low while waiting for the cover of darkness. The image of this young, curious female lion peering down at an eight lane highway perfectly exemplifies the barriers faced by animals living in developed areas. 11F was smart (or lucky), because her presence in the neighborhood went unnoticed and unreported, and she lived to return back to the hills the following evening. After her adventures with Hwy 85, she decided to head east, across a more manageable road. She was our first cat to successfully cross Hwy 17, sneaking across at the northern end of the Lexington Reservoir. We thought she might settle in Cupertino or Saratoga for a while, but after crossing a couple more times, she finally moved back to the eastern side of 17. We breathed a sigh of a relief when we realized she stopped crossing 17. Since her early adventurous years, 11F has settled down and stabilized. Her GPS data showed that she had kittens for the first time (that we know of) last July, but we were unable to find where she hid them or who their father might be. Sadly, with 11F’s death, the kittens likely perished as well; or perhaps she died defending them from another predator? 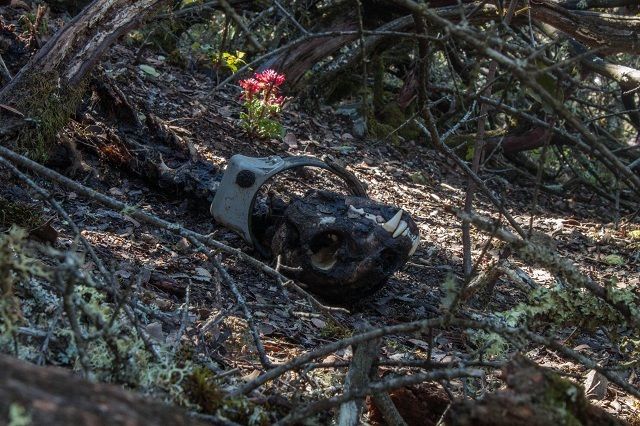 When we found 11F’s body, she had been scavenged and partially eaten, her body returning its nutrients back to the land it came from. It seems a bit ironic that after successfully evading being shot in suburbia or hit by cars crossing highways, that 11F would die of natural causes. But that’s the kind of cat she was, always full of surprises.